My name is Zoom and I come from the Moon! Happy Birthday Today! Were you a child of the 70’s or early 80’s? This Web page is for you! A resource to all things Captain Zoom! Scroll down to find frequently asked questions, lyrics, and a page to enter your memories! Remember, you’re the BIG STAR today! Are they still making this record? Do you work for Captain Zoom? No, I am not affiliated with Captain Zoom or The American Broadcasting Co. I am simply the product of a happy childhood filled with many listenings to the Captain Zoom birthday record. On my birthday, YEARS AGO, I blogged about my memories of Captain Zoom and I was absolutely taken back by the massive response to that entry. It seemed like a good idea to put up a Web page to direct people to the official Web site and give them a place to record their memories. Thank you, Dawn Eden for the scans of your Captain Zoom record! You’re the BIG STAR today! “Hey Zoom I got the bestest plan! As it turns out, my sister and I listened to the Zoom record at 45 rpms… and apparently it should have been played just at 33 1/3 rpms so Zoom sounded like a chipmunk… it seemed right at the time! I started collecting memories back in 2003. I continued until 2009. If you would like to add your own memory, just scroll down to the comments on this page. When my children were 2, 5, and 6, and I was in the toy store in the local mall (that has since been torn down and redone), I needed (another) little birthday present. Well, as every mother knows, you can’t get for just one. So, for the next couple years, Captain Zoom was the Big Star today at every birthday celebration. Long after the little plastic records were lost, I would sing at least part of it to them in person or on the phone. Now, almost 30 years later, it occurred to me, with yet another birthday coming up soon, that I might find all the words on the Internet. Gee, should I get one for a grandson? My grandma bought me the Captain Zoom record when I turned one in 1977. My son was born in 2004 and I was thrilled to find www.captainzoom.com where I was able to order a CD for my son to celebrate his 1st birthday. I hope to carry on the tradition. As others mentioned, it is so awesome to see how the song is such a special memory as it is in my mine and amazing how I still remember the words and it brings a smile to my face. I need to buy it for my 2nd son and I see they also have a DVD animated option too. I look forward to playing it at my son’s 5th birthday this weekend! My daughter turns 23 tomorrow, just for kicks I sent her a Facebook message with part of the Zoom lyrics. I’m sure all of my online friends will think I’ve lost it not understanding the meaning….. Both my daughter & son (20 yrs old) had a personlaized audio cassette in the late 80’s & played the heck out of it! I even have a video of “Kristen” and her party girlfriends dancing to the song on the front covered porch (I think she was turning 4 ) Her good friend Maggie was spinning & spinning to the song when she got dizzy & slammed into a porch pillar knocking her down. For years I’ve thought of turning that tape over to AFV for a shot at prize money. Of course Maggie was fine or it would not have been funny at all. I was just loooking where to find this CD, and I came upon your site! I am 36 and my mom bought the “record” for me when I was very little. To this day, considering we do not have a record player, and the fact that little flimsy disc is waaay gone, my mom calls me every birthday and sings the song to me verbatim!! :) It is a classic family tradition, and I am so glad to see so many others with the same memories! I have a son (my one and only child) who is turning 1 yr on 9/04/2009. Trying to find the CD to start the tradition with him! I can’t wait to sing, “Hey Sean, it’s your birthday today!” Although I have the format/words, memorized, I would love to get the real thing!!! If you have any easy links or suggestions on how to find this CD it would be great to hear about it! Thanks for your time! Today was my 27th birthday and, as has happened for the last 23 years, the Zoom song was played at my party. No matter where I am in the world, my parents call in the morning to play the song over the phone and mom sends along the tape (now CD!) to a friend to play at my party. This year there were three veteran listeners at the party and several Zoom virgins. Friends who now live in different parts of the world emailed to say they were thinking about the song. Not sure if you’re still updating your site anymore, but I just stumbled on it today and wanted to say thanks for helping me revisit a very pleasant memory from my youth. I’m not 32 years old and I guess I was probably 5-6 years old when I got mine (as with some other people here, mine was on a thin, square, flimsy LP). My cousin Jill also got one and just last year at Christmas, we were trying to remember all the words. Anyway, thanks again for posting this, it’s nice to see a lot of other people share this memory as well! Thank you so much for putting up your zoom site. I had a birthday party last night to celebrate my 33rd birthday. We put the Zoom record on as we do every year, only this year, the plastic record had a bend in it and started skipping. As if having a birthday isn’t depressing enough! I was really sad that I was going to have to leave this tradition behind, but thanks to you, I can enjoy the birthday song for many more years to come. Thanks for the memories part of the website, as I loved reading everyone’s memories. I received this wonderful song in preschool from my parents and played it around, during, and after my birthday. Then I grew out of using the record player and stopped listening to this song. My parents moved a few times and that record could not be found. My sister spent hours looking for it one year, but to no avail. I loved playing the record on fast, that way I could listen to a few extra times before bedtime. My sister and parents still try to sing a little of what is left. Now with the lyrics this song can continue for years to come. I know I can buy the song, but will it live up to my memories? I just had my first child and I will be singing this song to her. Thanks for the memories. I bought this record for each of my three children’s birthdays. I found your web site a few years back and reordered three new ones to reminisce on their birthdays. Then of course I had to buy for my grandchildren and now I am going to order one for my first great grandson. I’d say we go back a long way. I am just so glad that I found this website! I told my friends about my Captain Zoom tradition on my birthday and no one knew what I was talking about. This year’s birthday is bitter sweet (I turned 20 years old today!). My mom passed away from cancer about a year ago and a lot of traditions have been lost with her passing. I will always remember my mom playing this song for me and the other traditions we used to do. Thanks so much for putting this online so other Captiain Zoom fans and I can share our memories. A lot of your posts are from youngsters, so I thought I would add some maturity to your memories! My husband turns 45 this year and has ALWAYS had such fond memories of the Zoom birthday record he got as a young boy. He gets such a smile on his face and his eyes light up as he begins to sing, “Hey, Tim, it’s your BIRTHDAY!” I had never heard of Zoom until meeting him 27 years ago and got the idea to try and find it on the internet to surprise him this year. I’m going to include the comments from other Zoom fans found on this site. Thanks for they joy I know he’s going to get from walking down memory lane. Wow I can’t believe this! This song was a staple through my whole life on my brother’s birthday. For whatever reason he was the only one with a tape and we played it every year! Actually we played it more often than every year, which was what led to it’s disappearance. My brother got to the age where he was embarassed by it, he hid it, and it was never recovered. Fortunately my other brother and I knew the song by heart and we STILL sing it to him every year, fifteen years later! He’s a junior in college in England now, and I just got done leaving him a voice message singing the song. I googled the lyrics hoping to find a recording of it and I found this site! Oh my gosh, I’ve been wondering for years how many other people had the Zoom record growing up… and whose parents still play it for them every single year! It’s always my favorite thing about a birthday. I just turned 25 this year and lo and behold, there was the call from Mom & Dad at the crack of dawn blasting “This is Space Command to Zoom…” over the phone. The best part is this: My brother, Alex, and I (Katie) each had our own record of the song. Somewhere along the line, my record got lost. So every year, my mom sits by the stereo and turns the volume down when Zoom is going “Hey Alex!” so she can yell “KATIE!” instead! It cracks me up. I almost like it better that way now. They still play it for Alex too. A couple of years ago my folks were in town with me and didn’t have the record with them to play for Alex on his birthday, so during dinner my parents and I collectively remembered all the words to the song (including the adorable sound effects that the “outer-space creatures” make, e.g. “womp womp” and “cooooooklechoooo!”) and sang it to him over the phone. On a busy sidewalk in Chicago. People must have though we were nuts. But it was great. ‘Cause what’s better than “a song just from you?” Hehe. Love it! Like everyone else, I can’t believe I found this site. I’ll turn 39 this year and I’ve hummed this tune off and on for over 30+ of those years. I remember the ‘record’ being flimsy, but square shaped which I thought was interesting. I’m surprised that as I read everyone else’s memories I got a joyful tear in my eye. I’m overcome with a happy childhood glow just writing this email. Who knew a little $1 record my dad gave to me when I was little would have such a lasting effect. I’ve got to go buy the cd. Thank you for the website. My name is Jason and I was born in 1978, received my Captian Zoom record from my Grandparents in 1983. I loved it so much, I really thought he was singing to me and only me… played it over and over and it really isn’t a bad song. This past year I purchased numerous CD’s from www.captainzoom.com for my nieces and nephews, figured give them a little piece of history that will stay with them forever. One complaint I have is the newer versions don’t sound as good, who ever is singing and doing the overdubs sounds very amateur and it bugs me because I am a musician and pick up on that stuff very fast. I wish they could put together a new version of the song with some better quality singers… they really could make a fortune and keep the integrity of the product up. I was born in 1986, and my mom bought the cassette tape for myself and my brother who was born in 1988. We joked about the tape, and every now and then we would sing it. To my surprise, a friend of mine at college also had the tape. Her birthday is tomorrow, and I plan to sing her the song in the cafeteria, just like we have for the past three years. We’re both graduating in May, and our birthdays won’t be complete without the “Happy Birthday” song from Zoom. Our friends don’t understand, but we’re the big stars…today! When we were young, my neighbor bought the Captain Zoom tape for my sister. We played it every birthday and sometimes would even use it on other people’s Birthdays, just yelling their name over my sisters. Now we are all grown up, but my mother still calls my sister every year on her Birthday and plays the tape for her. It is such a great family memory. This year I was making a video for a friend and thought of the song, that is how I found the website that makes the tapes. I am getting my mom her own CD this year for her Birthday and know she will be very surprised. It’s amazing how such a small thing can effect the lives of so many people. I wish they would sell them in stores again! We we’re talking about birthday’s today, which made me think of this song!! My grandma got me the tape when I was probably 4 or 5 (Im now 15). I listened to it EVERY YEAR on my birthday, and sometimes when it wasn’t even my birthday. I was the greatest song ever, just because it had my name in it. Thanks for having a site dedicated to Zoom on the Moon!! There is just no words for the excitement I’m having. I am a new mother as of Dec 8 and have been thinking of this zoom song for weeks. I had this floppy record when I was young & played it till the record wore out. I just loved this song as a kid. I have been driving my husband nuts with trying to figure out the words from memory & was having no luck. He thought I was crazy because he never heard the zoom song & had no idea there was one made. I called my mom & asked her if she remembered where I got the record because I wanted to know if it was still made; I’d love to have one for my little girl. She said she had no idea where I got it from & that I should check the internet. This being a far-fetched idea turned into a dream. Not only did I find your website, but I could play a clip for my husband to hear & finally have the words again to help ease my mind. Plus the added bonus of seeing how I can get my own copy for my girl. I cannot THANK YOU enough for having your website, nor can I believe that this song has also impacted so many others in my age group. Whoever thought of this song was a genius! My twin bro and I were just on-line looking for our Zoom birthday song. Could it still exist? We each got the record from my Aunty Val (in the 70’s!) who had purchased them while on holiday in the States. Wow…all the way from America. Being Canadian all things American to a kid was pretty cool like candy that you could only get across the boarder. Pop Rocks and Tahiti Fruit pop were favorites of mine. Not only did Zoom come from the moon, he also came from America. Cool. Wait till I play it for my friends who can’t get it here! Ha. I still remembered everyone gathered around the record player to have a listen. Let’s play it again! And again…and again…for years my father would miraculously find that crapy piece of plastic and give it another run. Often first on high speed sounding like a smurf on speed (OOPS!) before realizing the goof and switching over to normal, mid-song. 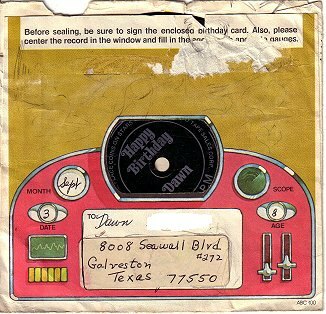 It seemed that only one record stood the test of time and would make an appearance for everyone’s birthday. The family chorus perfectly timed every cue to shout out the birthday name and drown out the recorded one. 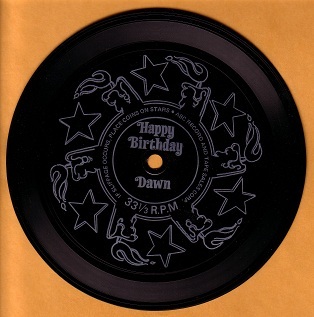 It was as if everyone had their very own personalized record…from Zoom! Special…all the way from America! I don’t know what ever happened to that record. It should have been put away with the china and silver and other precious things used only for special occasions. Like an heirloom, perhaps it will turn up in a box at my mother’s home one day?…along with my plastic button collection and cool cheap jewelry I picked up at the local fair with my name on it. One can only hope. Let’s see…there was my name in a leather bracelet and a skateboard necklace with my name chiseled into it. Priceless. But where Oh where can my little Zoom be??? Where is he now when I REALLY need him? This is earth Ruby calling out for Moon Zoom…are you out there Zoom??? It’s time!!! Today I celebrate my 40th birthday with my twin brother. As soon as I got on the phone with him I started to sing…Hey, ANDY! you’re the big star today! Sadly I could just remember one verse! He remembered Kukelchoo but that’s it. One word! That all ya got for me bro? What a treat to find your web site and have another go…this time we typed in RUBY and ANDREW. I think Zoom should come out with a twin special! I’ve printed out the lyrics and will tuck them into a special spot so I can start a new trend on friends birthdays! Hummm. Given that we are not ten-years-old anymore perhaps not such a great idea? You can’t re-invent that kind of Zoom history. You either have it or you don’t. HEY! I got it! I will still bring it out, and belt it out to family. They are in the Zoom club. That’s just what my brother and I did over the phone, this time with all the words! Yipee! I’m sure my bro has already ordered a copy of the re-issued CD off the Zoom web site for all us kids! I may be 40 today but in space time I’m timeless. Forever young!!! Good Times! Zoooooom-out! Ruby from Canada. This song makes my birthday feel complete. 😀 Looking on your site, I am completely tickled pink just looking at the old cover with Zoom sitting on his rocket with a bday cake in one hand. I LOVE IT!!! 😀 My husband now thinks I’m crazy, because he didn’t grow up with this song and doesn’t realize how awesome it is. I love this website, today is my sisters birthday … of course, as children we got to wake up to the zoom song for every birthday. I would even lay in bed awake waiting to hear the “this is space command to zoom”, so I knew I could get up and get my presents and birthday breakfast!! Well this year is the first year that my sister is living 6 hours away from the rest of us, so I wanted to email her the song for her birthday, but it has been years since I heard it, until I found this wonderfully memorable site. She thought I was a genius for knowing and remembering all of the words, I took the credit for a little while, but then finally fessed up and shared this site. We love it!! My name is Bonnie and I was sitting up late one night a couple nights ago and the zoom song randomly came to my head. So I decided to do a search for the lyrics. I remember the Captain Zoom song from way back when I was little. I would listen to it every year for my birthday. I am now 21 getting ready to celebrate my 22nd birthday in a month and since I am now married and no longer live within driving distance of home, I am having my parents send me my cassette tape so I can listen to it for yet another birthday. While doing my search for the lyrics I ran across the Captain Zoom website. When I was little my older sister Mary, and older brother, Ryan and I all had a Captain Zoom cassette tape…my younger sister, Carolyn, however did not…they did not have her name back then and she got stuck with a tape about walking in the park with Carolyn and animals. Well now 17 years later I find this site and have ordered a CD with her name so for her 18th birthday she too can share in the joy of Captain Zoom. I also ordered a CD for all three nephews, as well as my husband’s cousins and two younger sisters! I loved…and still love to hear the captain zoom song every year and am glad that it is still around to share with the next generation!!! OK, so I used to listen to this tape over and over again as a child. I still know all the words, and torture my husband by singing it to him at night, over and over. Wow, you have no idea how happy you made me when I found your site googling for this record. I thought that my siblings and I were the only ones who remembered this. I must have been 5 or 6 when I got my record for my birthday. I am 25 now and still remember listening to it over and over again. My Aunt and Uncle bought them for five or six of their neices and nephews and we all still remember them. In fact a really funny story with it is, my cousin Laurie got her record and it said her name on the cover but when she played it, Zoom came on and said ” Hey Larry” we still laugh about this all the time and now that I can but these on CD, i am gonna pick one up for everyone and I cant decide if I should get Laurie a real one or a Larry one. Thanks again!! Hey Kathy, you’re the big star today! We thought it was the greatest thing ever… and obviously it made an impact that we are still singing it 25 years later. So, I asked Eric, my brother in a status meeting a few minutes ago, “when I say “Hey Eric it’s your birthday…” what do you say?” and he answered with the song above and added the next verse, which I did not remember. So, anyway a member of the group sent me your website that told me that the song is still out there for purchase.. So instead of Kathy’s day being the greatest thing ever.. it is mine because I am going to buy it right now for my brother’s birthday! Wow! I can’t believe that I am not the only one! I remember being a kid and seeing the big spinning rack of records at Ben Franklins. I was with my bestfriend since birth, Kristin. We both begged for one for our next birthday. I am now 31 years old, and my father has played that record over the phone on my birthday EVERY YEAR SINCE! Who knew that a cheap little record could end up being one of the most cherished memories I will ever have. By the way, I can’t tell you how excited I am to know that they still make them! I am going to surprise my father on the morning of HIS birthday with a wake-up phone call……”Singin’ Dale, It’s your birthday today!!! I don’t remember how old I was when my dad’s adopted mother Martha, my grandmother who lived in Indiana sent this to me for my birthday. I remember over the years listening to it over and over. She passed away when I was in 2nd grade but I can still remember every detail of her. So when I hear this song it is like seeing her all over again. I remember when these records first came out. I was 8 years old, and I saw them in Rogalla’s Rexall Drugstore. If memory serves, they sold for about $1 apiece. I thought they were the coolest thing, and lo and behold, about a month or so later when I turned 9, my sister had gone and bought me one for a birthday present! I remember fond memories of hearing that thunderous rocket ship approaching on the morning of my birthday for many, many years afterward, blaring as loud as possible without distorting through the speakers of my parents’ 1966 Zenith console stereo (my parents have never been “high-tech”, per se, but they knew a good solid name brand when they saw it), I just happened to be thinking of this song the other day for some reason…”This is Space Command to Zoom, all systems are go for your message to Keith”….To this day, it still gives me a lump in my throat to hear that wonderful song! Now, some 30 years later, I happen to find out it is still available, but on CD format, albiet the price has changed somewhat. Back then, you could get the whole song for a buck, now it’s a buck for every time your name is mentioned! LOL I still have my original floppy record, along with records with the names of my mother, father, and brother, all in their original packaging. 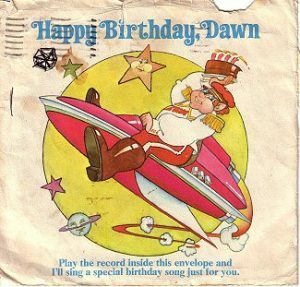 I have heard other birthday songs of similar fashion over the last several years, playing off the same idea as Zoom, but none of those could ever compare to the priceless gems of the mid 1970’s from a space dude named Zoom! I will cherish these records forever. Captain Zoom was definitely my most favorite thing about my birthday growing up…Mom would head up to the attic pull out the box with the Zoom record in it, dust it off, and then we’d play it (with coins in the appropriate places on the paper thin record)….I loved it… Well, now that I’m almost 30 and a mom myself, I find that nothing is a better 1st birthday gift for the babies of folks from my generation than a CD of the song with the kid’s name…. Maybe no one I know goes as gaga over this- but my little guy turned 2 this week and we must have played Zoom at least a dozen times and he was so happy and dancing around and saying “zoom”…. It’s just the best. i have heard the Captain Zoom song on my birthday for as long as i can remember. There were some years that i heard the song 3 or 4 times on my birthday most years i heard it at leat twice. this year i was not home on my birthday but i was home just the day before and my mom played my tape and changed it to where ever it said today she sang nice and load tomorrow. my mom alway has fun play our tapes for my sister and me own our birthdays. The records are bent but still playable. I played them over the phone to my son while he was away at college (he’s now 30) and my daughter’s (now 26) date played it at the Prom. Now they will get their own CD. We LOVE this little tradition and I’m so happy you posted the site and I went looking. This makes my day!! Today was my daughter’s birthday — Laurita. She is far off from home but she still got to hear “Lauren it’s your birthday!!!! No matter how far you go, Captain Zoom will sing to you Happy Birthday, Lauren!!! Sorry your Mom and I were not able to be there to dance around the breakfast table to the tone of Zoom, making perfect fools of ourselves, as has been our tradition for many years! Happy Birthday sweet!!! I am so happy that there are other people out there who enjoted this song as much as me. I am 28 and remember my dad pulling out that record every year on my birthday. Where the heck am I on the web looking for Captain Zoom and finding other afficianados?? I like it! I love this song, and was talking to my mother who cannot find the so called “record” My grandmother sent it to me, and I loved it and played it over and over again. I asked just this week for her(mom) to find this record, as she keeps all of my belongings from way back, and she could not find it. I know it was on some strange kind of vinyl, floppy, thin etc…I can’t recall all of the words either…anyone who can help with words…Please email me!!! My Name is Zoom and I live on the moon! V.
Today is kate’s birthday. I am going to sing this song today for her. For other birthdays, we will do this song. If anyone saw captan zoom in real life, people might get mad. So I will not say,” Thanks zoom. I’ll see you soooooooooonnnnnnnn!” It is not good. I hate to do that for older students. I just turned 26 and my father has played that song everyday of my birthday for the past 20 years when we are together. I moved out to California, 2500 miles from home but he still managed to arrange my boyfriend play the song for me. I can’t help but smile everytime I hear it and I hope other enjoy the same.